A yearly training program concerning the different aspects of corrosion. 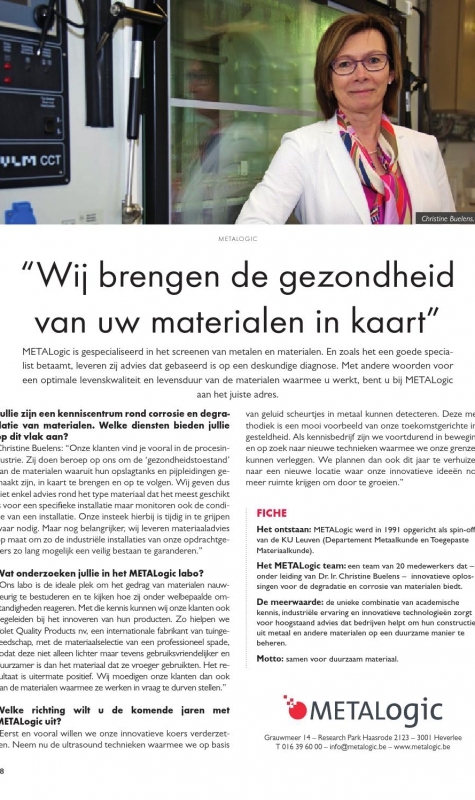 METALogic wants to be the corrosion partner of its customers. We accompany our customers in all the decisive stages of an installation’s lifetime to prolong its safe service life. METALogic offers a wide variety of products and services for investigation and monitoring of material degradation phenomena in general and corrosion in particular: Lab services, On-site services, Corrosion engineering & consultancy, Training and Gamry equipment. The customer base of METALogic is mainly situated in the Chemical and Petrochemical sector, Pharmaceutical industry, Manufacturing industry, Automotive industry and Offshore & Maritime sector. We would like to keep you informed of our latest news, tips & advice. Please visit our blog regularly and do not forget to subscribe to our newsletter.